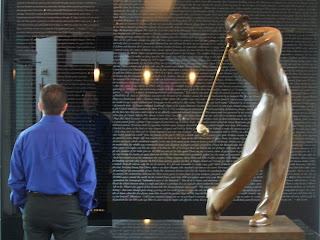 Not actually Tiger himself, but MyoMed is at the Nike World Campus in the Tiger Woods building! The campus is BEAUTIFUL! It's a must see in Oregon. 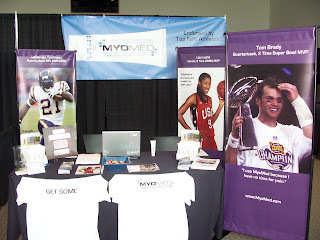 We are there for a Sports Symposium this weekend, we are having a lot of fun, meeting doctors from all over the world and telling them about MyoMed. Everyone has been very excited about it, as there really is nothing else like it out there. It's really getting the name out there! 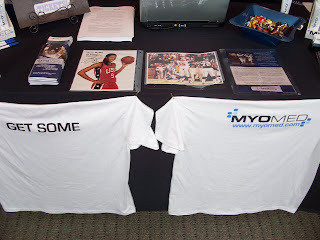 These are pictures from our booth. Advertising starts this month, we just got samples and the bigger bottle with a pump for clinic use, more and more exciting stuff is coming up-we are so excited to be a part of this awesome business from the start! Nice booth! Those shirts are pretty funny. I can tell you already my brother in law wuld want one. Good luck to you guys. P.s. 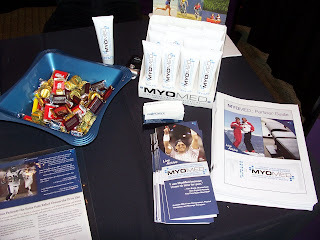 how big are the sample sizes of Myomed? Let us know when the kinesio tape comes out. I want that shirt hahaha! hey! the booth looks really great! that is a good idea about getting some shirts and selling them, i know lots of guys that have asked for them around here. tiff, i love that mary kay lip gloss, might have to get more!